Photo, above: Just hours ago, concertgoers were running for their lives at a Justin Aldean concert in Las Vegas. 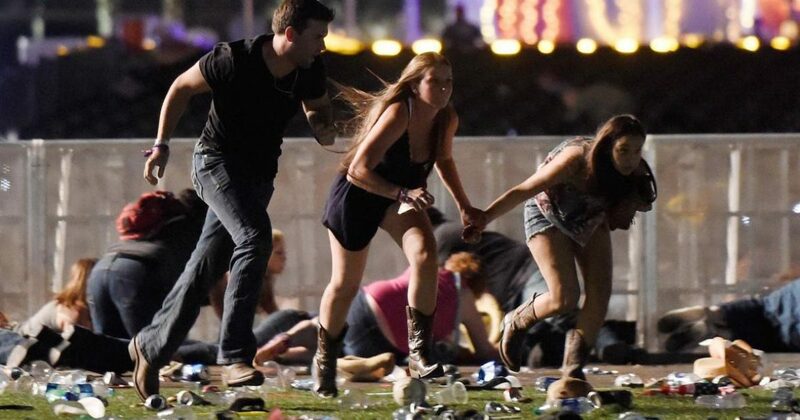 Police have identified the perpetrator of the worst mass murder in US history, which happened last night in Las Vegas at a country music concert. Reports so far are over 50 dead, over 400 wounded. From the 32nd floor of the Mandalay Bay Hotel, the perpetrator, local resident Steven Paddock, was shooting concertgoers crowded together in the outdoor venue with automatic rifle fire which some have described as sounding like AK-47 fire. God Bless the victims and their families. We will continue to update this story as details become available. Please send us any new information you receive, especially those of you close to the scene. Authorities have identified 64-year-old Stephen Paddock of Mesquite, Nev., as the suspected gunman in the massacre that left at least 50 dead and more than 400 wounded Sunday night at a Las Vegas casino, according to The Daily Caller. Las Vegas Metropolitan Police Department (LVMPD) Sheriff Joseph Lombardo said Paddock, who was employed as an accountant, had a pilot’s license and a hunting license and no criminal record. Authorities found ten unspecified weapons in his hotel room and a camera system, which authorities believed Paddock set up to monitor their approach. 406 people were transported to the hospital including two on duty Las Vegas police officers. One unnamed off duty officer is among the dead, according to an LVMPD press release. Police have located the suspect’s wife, Marilou Danley, a 62-year-old Asian female, believed to have been traveling with Paddock prior to the attack. They do not believe she was involved in the incident.